Which Game Is the Best Match for This Steampunk Xbox 360 Controller? Looking at the controller's unlockable beauty make me wonder what would be the best pairing, game-wise, for it. Two games that come to mind are Bastion and the upcoming BioShock Infinite. Supergiant's Xbox Live hit had a bit of a roughhewn, rustic look in its design and Irrational's flying-city saga evokes an early 20th century aesthetic, what with its skyhook and dirigibles. 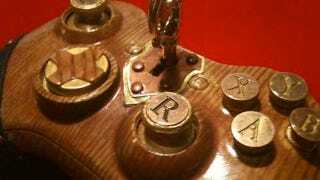 The steampunk controller looks like it'd fit in both worlds, as if it's what the Kid or Booker DeWitt would use while playing an analogous projected entertainment device. The controller doesn't appear to be available on the MorbidStix site, but I'm sure a uptick in demand would make them pump out some more. And, while not present in mass quantities, it's likely available on request.